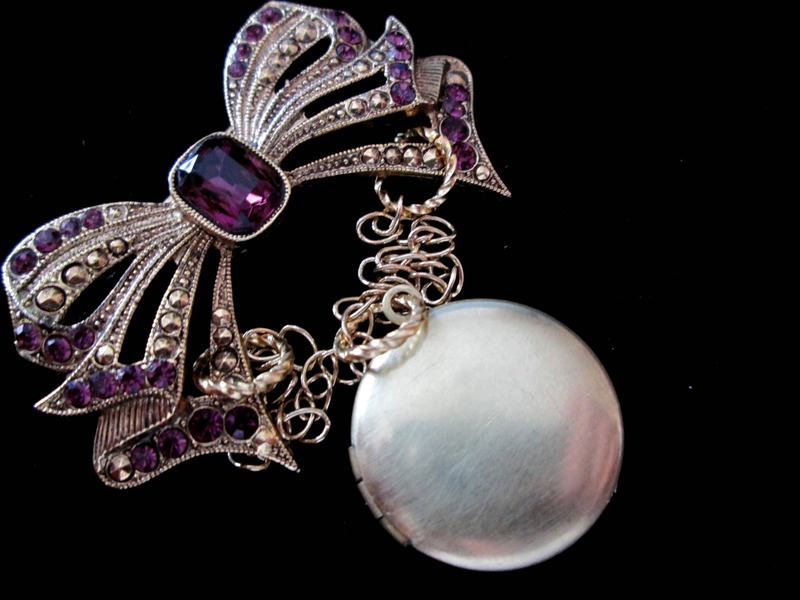 This brooch is made with a gorgeous vintage gold-plated bow brooch with faceted purple glass rhinestones and a central faceted rectangular rhinestone. To the brooch I hung a small round brass locket from a gold-plated chain. The chain chain can be lengthened or shortened as desired prior to shipping. The locket opens to hold two small photos. As this piece is made from vintage recycled materials, there is some slight age to it. This pin hangs approximately 4 inches from top to bottom. The bow is approximately 2 inches in length. The photo portion of the locket is approximately 20 mm in diameter.